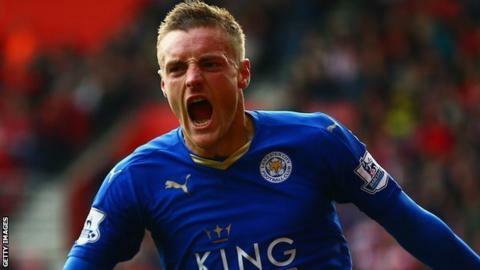 Chasing Jamie Vardy: What turns a non-league striker into a star? Scoring goals isn’t always enough. It may sound counter-intuitive, but for a host of talented non-league strikers it is advice worth heeding. That is because it comes from John Morris, the man who discovered Leicester City and England star Jamie Vardy, and is the co-founder of his V9 Academy. Morris believes non-league football is full of talented players ready to take the top-level by storm. But those who are going to make it need four vital ingredients – mental, physical, tactical and technical qualities. There are certainly plenty of players scoring goals by the truckload in non-league football. Ricky Miller’s 40 goals for Dover Athletic in the National League saw him snapped up by Peterborough, Danny Rowe at AFC Fylde was only four short of 50 league goals for the campaign, while 10th-tier star Leon Lobjoit’s 62 goals in 36 games for Buckingham earned him a move to Northampton Town. If they are looking for footsteps to follow, they need to look no further than those of a 25-year-old snapped up for £1m who has gone on to win the Premier League and play for England. The Jamie Vardy story is as well told as it is spectacular – and he and Morris are so confident it is one that could be repeated they are putting their money where their mouths are with the formation of a new academy. The V9 Academy will host 42 non-league players at Manchester City’s training complex in early June. “I really do think there are good enough players in non-league football,” said Morris. “Clubs have to be prepared to coach players. Many want instant success, especially when it comes to lads from non-league football. Morris believes goalscorers will generally find their level. “It looked obvious with Jamie,” he said. “I was asking ‘has anyone else seen this?’ He’s very similar now to when he was in non-league. “I’ve looked at other lads who are scoring loads of goals and said ‘that is his level’. Scoring goals isn’t always enough. According to Morris, one factor top clubs put a premium on is the age of a player. “Clubs want 17 to 23-year-olds. If they are too old for the under-23s, clubs say they need to be able to start in the first team. My argument is some people mature mentally and physically later,” he said. V9, as a result, will look at players aged 17 to 30, some of whom, may have missed out on being picked up by big clubs because of work commitments or by spending years doing a university degree. Two players looking for those vital breaks spent this season battling it out at the top of the scoring charts in the Northern Premier League Premier Division, the seventh tier of English football. Luke Benbow and Daniel Maguire have both flirted with the big time. These days, in true non-league style, they are banging in the goals while working as a builder and a plumber respectively. Stourbridge striker Benbow, a former Birmingham City trainee and graduate from Glenn Hoddle’s Football Academy, hit 32 league goals this season. “It is the most goals I’ve scored,” said the 25-year-old, who has also had trials at Charlton and Burton. He trained as a bricklayer’s apprentice after realising he had to do something “if the career didn’t work at football”. Maguire netted 30 times in the league for Blyth Spartans. The 24-year-old made headlines for scoring a hat-trick in 11 minutes in 2014-15, attracting the attention of Halifax Town. He eventually joined the then National League outfit. However, his booming plumbing business won a major contract. With the Halifax deal being on a part-time basis and the potential of a five-hour round trip for training twice a week, Maguire opted to return to Blyth just three months, one pre-season and no appearances later. “It is hard when you have mid-week games away to be up at 7am the next morning,” he said. Morris, who spotted Vardy when the England striker was playing in football’s seventh tier, believes the number of talented players in non-league football is increasing as more youngsters are rejected by Premier League academies. “How many 18 or 19-year-olds are coming through and playing in first teams?” he said. He said many players “go in to their shell and give up on the dream”. One such player is AFC Fylde’s Rowe, who was released by Manchester United at the age of 16 and, he admits, “lost a lot of enjoyment out of the game”. Despite having played alongside the likes of Tom Cleverley and Danny Drinkwater, Rowe found himself “just playing with my mates really”. The 28-year-old was later picked up by Fleetwood, where he was a teammate of Vardy’s for a time. He also stressed the importance of assessing what players are like off the pitch, who they associate themselves with, whether they are good or bad trainers and what they are like in the dressing room. Players, said Morris, have to be robust to play in the Premier League where “even small players are powerful, strong lads”. He stressed the technical and tactical side of their game can be worked on. “Are they a bit raw? If he’s technically not good enough, that is a coach’s job,” he said. “If they’ve got those four ingredients nailed on they probably aren’t playing non-league football. “We are not always looking for the best players. We are looking at the lads who will give everything. It is not impossible to make a successful career in non-league football. One player who has done just that is North Shields’ Gareth Bainbridge. The former Hartlepool, Middlesbrough and Darlington trainee’s brightest moment came when he scored for Shields in the FA Vase at Wembley. Although he has called time on his own English Football League ambitions, 30-year-old Bainbridge says there has never been a better time for non-league players to be spotted. “There is so much more coverage and respect for non-league football,” he added. Perhaps, for some, scoring goals will be enough. Zig Zag Productions are excited to produce this documentary coming soon to Sky.